Wherever you stand, be the soul of that place. Your bright gaze will kindle this old shadow world to Blaze up once again with the fire of faith. We are shifting from the industrial age and the age of information and technology to the biological age where we are asking how do we create spaces for life to happen and align our thinking with how nature thinks. 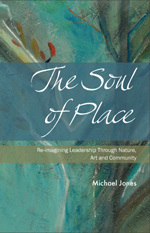 In my new book The Soul of Place I explore how our relationship with place in nature, art and community deepens our connection with the core energetic patterns that form the undercurrents of life and living systems.